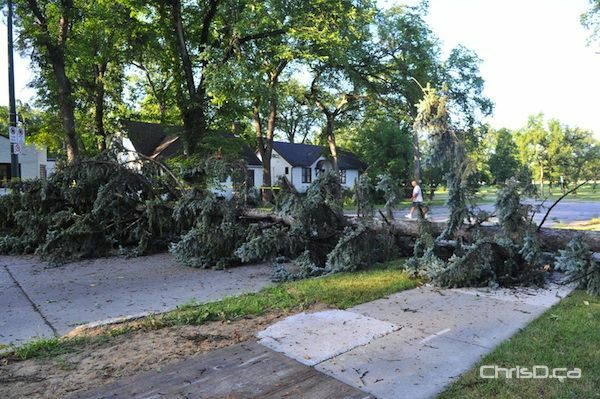 The clean-up from Sunday’s brief, but destructive storm has begun. Toppled trees, downed power lines and other debris still plague many Winnipeg streets and crews will have a busy day ahead of them. The high winds mixed with intense thunder and lightning began around 6:30 p.m. and lasted just over an hour. Environment Canada clocked wind speeds at up to 150 km/h at one point, which was strong enough to rip off roofs in one part of North Kildonan and blow out vehicle windows in other parts of the city. The brunt of the destruction appeared to be in the River Heights area, where decades-old trees were snapped like twigs — many of which landed on vehicles and blocked roadways. Manitoba Hydro was kept busy trying to restore power to thousands of residents. Downed power lines also became an issue, as firefighters and police guarded areas until crews could arrive to shut off power and begin repairs. Power outages were reported in Fort Garry, Lindenwoods, River East and St. Boniface. Outside of Winnipeg, residents in St. Laurent and Twin Lakes Beaches were hit with twister-like damage, as photos of structures being torn apart began making their way across Twitter.